I’ve been going through my closet with a critical eye, looking for items of clothing I haven’t worn for ages, but don’t want to get rid of. I’ve decided that by shopping my closet and making a few nip/tucks, I’ll add some much needed new pieces to my current wardrobe rotation. Easiest project first. Skirts. I have so many skirts. When I first learned to sew, I went crazy sewing up skirts since it was the only thing I knew how to make. They all seem to be around the same length – knee length. After all these years, that seems too long for right now. I picked three skirts I made ages ago that I hardly wear, but love. The red is a heavy cotton canvas with leather buttons at the top. The turquoise is a soft corduroy. The grey is actually a lovely iridescent fabric that is silvery grey with a shot of yellow depending on how the light hits it. After trying them all on, the right length seemed to be about 17″. I measured, chopped off the bottoms, pressed up about an inch and hand sewed an invisible hem on each. Three newly refreshed skirts for me to wear in the blink of a crafty eye! fabulous!!! i have to admit i like them all before too, but the updated versions will be so lovely for this summer . . .
so fantastic! you totally read my mind, last night I bought four dresses from jcrew and four from nordstrom, I love the prints but the length…blech! I’m totally going to chop them! I love the invisible hem, I’m going to google it now! Also, the gray totally stole my heart! you = best! Well done! It ‘s really better like that! Cute!! I am loving your blog so much– you just keep cranking awesome stuff out! So inspiring. Thank you! I just got distracted by the chair and the cute desk peeking out (I love the book holding up one end!). Anyhow, holy cute! That kicky length is perfect for you — I admire that you can pull it off! 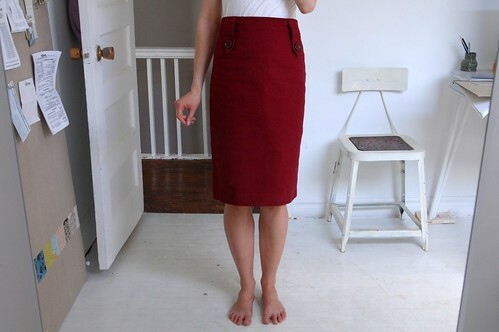 These skirts are also so perfect for the owner of a sewing studio! 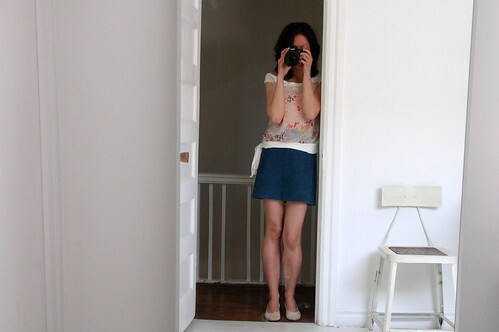 You’ll really inspire people to make their own fun summer skirts. wow you’ve got a nice set of legs! your “new” skirts are a much better showcase for them. SOOOOOOO CUTE!! I love them all! My favourite is your last skirt! That grey with bits of yellow is so pretty!!! What a great idea. I thought they were cute to start with, but you’re right, this totally updates them! super cute and so inspirational! love the top you’re wearing with the grey skirt and I too, was distracted by your lovely chair. Those are fabulous edits! Very awesome! nice work! I liked the red one before, too. I think the gray skirt was the biggest wow — so cute! So motivating! I really need to find some time to improve my very poor sewing skills. I love the edit to the red skirt – makes the sweet button detailing even cuter! I love love love the red one! Do you recall what pattern you used? Fabulous idea!!! Now I want to go through my closet! Love the red one. lol. i feel a bit shy now about showing so much leg. thanks for your compliments on the skirts. it really underlines the fact that sometimes it’s the simplest of things that has the most impact. thanks ladies!! Raphaelle – all these skirts are patterns that I drafted up myself. i just use a basic skirt pattern and do variations on it. I too was distracted from the skirts by the gorgeous white room – I want one! great job karyn! i think all the lengths of the skirts work for you! ohhh ps. is this your new “13 dresses”???? i loved your 13 dresses! they look really great! my favourite is the grey one! it looks amazing with the sparkly top!